Halloween & Christmas Fabric on SALE! This month Carolyn will be discussing, Two Color Quilts. This informative and fun series is always SO much fun and you'll learn a thing or two! Discussion will meet Friday, October 16, 10 a.m. - noon. Save your spot today. Our new Premier+ Software is NOW available! Come by and demo this amazing new product. It is what you have been waiting for! No fee for participating. Blocks are due Oct. 21, check out details here! Sign-up taken by phone or in shop. 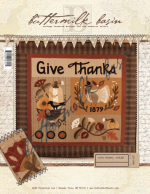 This adorable kit is made from cotton backgrounds appliqued with wool. Come by the shop to see our first blocks, they are wonderful. Start it today and have it done for Thanksgiving dinner!